Yes, when we got up this morning, it was 10 below zero. I took this photo from our front door, looking west towards Widget's House, about 7:30 a.m. There wasn't a peep coming from over there ... the dogs were totally sacked out. On summer mornings by this time you can hear them all barking, ready to go outside. On cold winter mornings like today, with the big ceiling-mounted unit heater quietly whirring and keeping the building toasty warm, those dogs are still sound asleep when I head over at 8 a.m. to let them out. And speaking of Halloween, here's our costume entry this year: It's blind-and-deaf Spinner, who decided she'd appear as a ... snowcone. Spinner figured if she has to wear a cone on her head, she might as well have some fun with it, right? So a snowcone it is! I'm From Miami. I Don't Do Snow. We had a fierce winter storm blow in last night, although more wind than snow, and the temperature plunged. This morning when we got up it was 11 degrees. 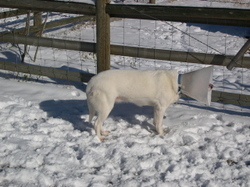 All three-legged Cody had to do was look out his cottage door this morning and decide he was NOT going out there. "No way," he seemed to say. Cody came to us from a rescuer in Pennsylvania, but he had started out his life-saving journey in a high-kill shelter in Miami, Florida before being transported to Philadelphia and then on to us. So he is a complete 'weather wuss,' as we call him. Thus this morning he absolutely refused to go outside when Alayne was trying to get the dogs in Kelly's Cottage to roust themselves and head out for their potty business. He sat down, he laid down, he rolled over, and he ducked into a crate to hide. In short, he wasn't going. Alayne finally had to pick him and carry him out the door and set him on the ground. I took this photo of Cody when Alayne and I were coming back from Widget's House this afternoon, when the sun was shining and it had warmed up a bit. But I think Cody spent all of 15 minutes outside today. He's in for a rude surprise tomorrow morning. As I write this at 8:30 at night, it's already minus 4 degrees and will be even colder when we wake up! 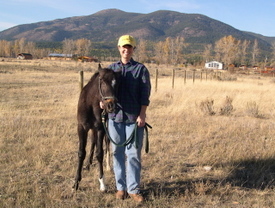 We're now successfully weaned our little blind foal, Brynn, and it went without a hitch. Regular blog readers may recall that baby Brynn has several medical problems, including a hole in her heart, an ectopic ureter (one kidney is sending urine to her uterus and not her bladder), and malformed vertebrae in her neck. But so far she is doing just fine, and growing ... and growing! Because her neck is so short -- she literally can't reach the ground with her mouth -- we have to pile up hay so she can reach it. For the past couple of months this meant feeding her separately from her momma during the day, or the mare would have eaten all that hay instead. (And her Mom was quite the pig!) So Brynn spent her days in a pen next to her momma, happily munching away, and then we'd put her back with momma at night to nurse. Thus the weaning process started early and gradually. So when the time came to say goodbye to her momma, Brynn wasn't upset at all. We expected at least a little crying and vocalizing, but she didn't make a sound. Nor was the mare upset, either! When the folks came to pick up the mare, Alayne and I walked her out to the trailer and calmly loaded her. She didn't even look back towards Brynn's pen (okay, so putting some grain in the feed manger in the trailer kept her focused!). With the mare in the trailer, I slipped a halter on Brynn and walked her through the corrals to her new stall in Lena's Barn. It was an adventure for her, and before long, Brynn was inquisitively exploring her stall, smelling the new smells and feeling her way along. As the trailer left with momma on board, Brynn had her head buried in a new pile of hay. This may have been the most stress-free weaning ever! I spent most of today spreading the final windrow of compost on one of our south pastures, making multiple trips with the tractor and manure spreader from the compost "yard" behind Lena's Barn to the pasture. 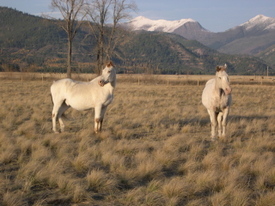 On each trip I would drive through the pasture where two of our old guys, blind Blue and blind Shasta, have been hanging out for the past couple of months. By late this afternoon, they had begun dozing off, catching the last of the sunshine as they napped. I took this photo of Blue and Shasta on my final run with the spreader about 5:30 p.m. That's Blue on the left and Shasta on the right. (They look like a matched pair, don't they?) Now, one of the nice things about blind horses is that you can leave gates open as you come and go ... and they won't go bolting out and down the drive. So all day I left both gates into their pasture open as I drove in and out with the tractor to reach the far pasture where I was spreading. This was the first summer we could actually leave Blue out to graze around the clock. When he first came to us from the U.S. Forest Service a couple of years ago, he was so obese we had to keep him confined in the corral so we could maintain him on a strict diet. Slowly the weight came off, and late this summer -- once the grass had browned out and the protein content diminished -- we were able to turn Blue and his buddy Shasta out to pasture and let them spend the fall grazing all they want. Here are two of our Dachshunds, Callie who is blind and Bailey who has orthopedic and neurological issues, hanging out by the dinner table. I thought this was an interesting photo because of the way the flash reflected straight back from Callie's retinas. Hmm. A bit early for Halloween, perhaps. Callie's blind from progressive retinal atrophy (PRA), in which retinal function diminishes because of a loss of blood to nourish the retinas. To compensate, the pupils completely dilate to try and get as much light in as possible, although towards the end of PRA (as in Callie's case) it doesn't matter because there's no vision left. 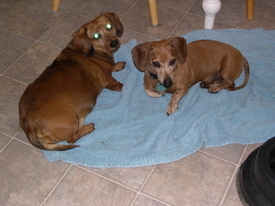 The two Dachshunds have made themselves at home on the towel we keep on the floor by the water bowl -- the black object on the right -- which is actually a salt block holder for horses. (I think I've mentioned this before on the blog.) It's heavy, has a wide base, and is hard for big blind dogs to knock over. However, it doesn't keep them from walking into it, or from the 'drink-and-run' types like Birdie who manage to leave more water on the floor than they get down their throats. Hence the ever-present towel. Alayne took blind Willie the Beagle and paralyzed Spirit the Yorkie to our vets in Helena today. Willie is dripping blood from his urinary tract, and he also has heartworms, so we need to have his heart function assessed before we can begin treating him for the heartworms. Spirit has developed an ulcer of some sort on her left eye and it's beginning to cloud up, so we are very concerned about what's going on there. 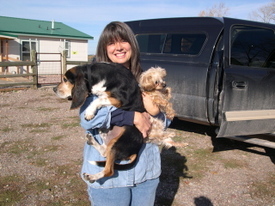 I took the photo of Alayne holding Willie and Spirit just before she left for Helena this morning. 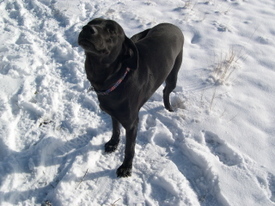 Willie sat very still, like a big lump of coal, while Spirit wriggled like a fish on a line. Alayne managed to hold on to both of them long enough for me to take some photos, and I'm proud to say she didn't drop either one the entire time! 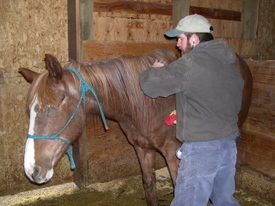 Alayne left Willie and Spirit at the clinic, where they'll spend the night. That's the sanctuary truck behind Alayne, and no, we don't wash it -- there's no point when you live at the end of three miles of gravel road! Our horse trainer, Nichole Zupan, came by for her regular Monday evening workout with blind Nikki. I took this photo while Nichole was saddling up Nikki for a session in the round pen. Nichole's schedule with Nikki is Monday and Wednesday evenings and Friday mornings. We try to keep to this three times-a-week routine, weather permitting, of course (which is getting more iffy this time of year). Here's what it looked like from the other side ... you can see Nikki's pasture buddies, blind Lena and blind Destiny, in the adjoining field. We had just moved Nikki from that pasture to the round pen. Now the other two girls will patiently stay close by, waiting for class to get out. 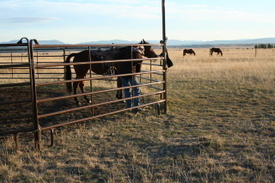 It's the cutest thing -- they always wait for Nikki to get done, and never wander far from the fence line. I was headed out to start barn chores this evening when I looked back over my shoulder and saw this rather peculiar sight by the front of the house. 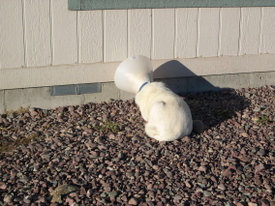 Deaf-and-blind Spinner, wearing a cone on her head, was pressed up against the wall as if she were listening for termites or trying to pick up CNN from the TV in the living room. Spinner is wearing the cone because she has a sore on the bridge of her nose that started out as a small thing, but she began rubbing it so much that it became big and gnarly. That defeated our attempts to get it healed. So we put the cone on Spinner about five days ago. She immediately went into a funk, or what I call a 'perpetual pout.' She refused to move, so we had to carry her out of Kelly's Cottage in the morning and set her on the ground .. where she remained for the rest of the day, not budging from that spot. It was a protest of some sort. This went on for days, although I'm happy to report that she has finally begun to wander around the yard again. I was actually rather pleased to see she had gotten as far as the front of the house this evening. But why was she lying on the rocks (when there are dog cots all over the place, not to mention grass), and what was with the cone on the wall? As I stood there, taking photos, the moment -- and the questions -- came to an abrupt end when big, blind Kenai sauntered over and walked right on top of Spinner. (Blind dogs will be blind dogs.) Spinner bolted to her feet and spun to the left, her reverie rudely interrupted, while Kenai spun to the right and disappeared around the corner. We noticed yesterday evening that our blind horse Chance hadn't eaten all day. Usually he plows through all the hay and grain we can give him. He is beginning to deteriorate from his two-year long battle with lymphoma. Just in the past two months he's begun losing weight and his hair coat has become dull, and we know the cancer is taking its toll. So we wondered yesterday if his lymphoma had something to do with it ... or whether it was something else, like being pre-colicky. From the barn I called our equine vet, Dr. Bill Brown. Bill asked me to listen to Chance's heart rate, take his temperature, and report back. Alayne went to the house to get the stethoscope and thermometer, and then she held Chance while I took his vital signs. They were, in a word, bad: His heart was racing at 80 beats per minute (normal is 30-40) and his temperature was 104.8 degrees (normal is around 100). I called Bill with the results. "That's a sick horse," he said. Bill had us give Chance a massive dose of Naxcel, a powerful broad-spectrum injectable antibiotic, and a dose of Banamine, an anti-inflammatory. The Naxcel dose was so large -- 40 cc's -- that I had to inject it in three different places on Chance to avoid overloading any one injection site. This morning Alayne and I went out to the barn with stethoscope and thermometer in hand, not sure what kind of condition we'd find Chance in. That's when Alayne took this photo of me listening to Chance's heart. We were relieved to discover his heart rate had dropped to 48 beats per minute, and his temperature had dropped to 102.6 degrees. I called Bill to report on the progress. Bill told us to give Chance another (smaller) dose of Naxcel and to repeat the Banamine, then take his vital signs again this evening. And tonight, Chance's heart rate was normal at 36 beats per minute and his temperature was 99.5. That's a remarkable turnaround in 24 hours -- whew! Let's Share. Well, Okay Then. So ... 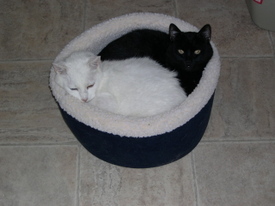 THIS morning when I went into the cat house to clean, look what I found -- wobbly Mink and deaf Snowball squeezed into that little round bed. It turns out there IS room for two after all, assuming you like a tight fit. Lulu was right, and apparently Mink just wasn't very accommodating yesterday. It does make me wonder who was in the bed first, and just what kind of maneuvering the second cat had to do to get in there. As you can tell from these photos, our cat house is a very snuggly place indeed.